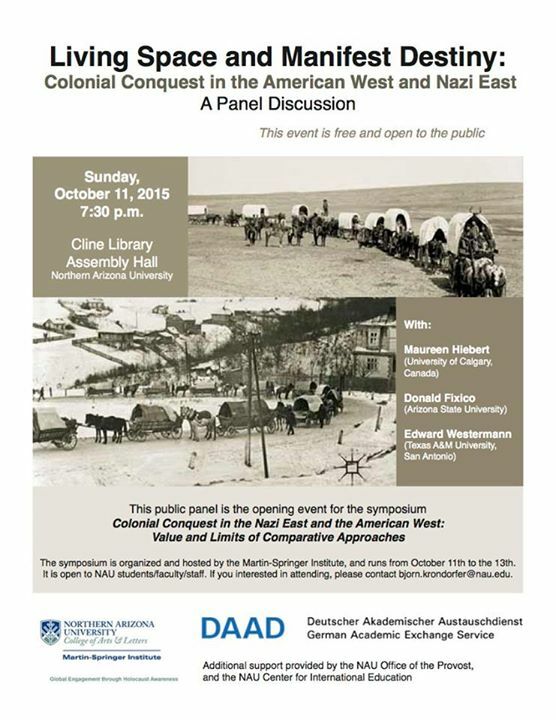 Between 11-13 October, I was invited to a symposium titled “Colonial Conquest in the Nazi East and the American West” at Northern Arizona University’s Martin Springer Institute, Flagstaff. The symposium was part of a larger collaborative effort in comparative genocide studies that I had been introduced to during my lecture tour last fall. In disciplinary terms, I was once more amazed how wide the field of Holocaust studies/ history of Nazi Germany and World War Two is―from my own work, I felt well-versed in the field of Nazi media and propaganda, especially regarding Indianthusiasm, and nationalist/völkisch/Nazi ideology. However, it can be daunting to learn about author’s names and case studies in―often only slightly different―fields of interest, all coming with their respective scholarly networks, debates, academic trenches, historiographical infighting, annual meetings, and the like. What struck me in particular about the meeting was how differently the question of comparing the Nazi East and the American West can be approached, and how these approaches will produce vastly different, often contradictory results and representations of these results. The question of genocide in the Nazi East and the American West is not merely a matter of debating intent and effect. It must consider and distinguish between ideology, public discourse, corresponding formulations of state policy, propaganda (domestic and foreign), and finally, observations on how the policies were implemented on the micro-level: by state agents, i.e., local commanders who must strike a balance between directives and improvisation as required by the moment, and by non-state agents, i.e., settlers and settler militias. These micro-level perspectives often enough requires empirical case studies whose results might contradict any of the above criteria and make comparison and generalizations between the Nazi East and the American West exceedingly difficult. One prime example might be the oft-cited references Hitler made to the Euro-American conquest of the West when discussing his plans for the Nazi East. We know about these references from documentations of his Table Talks and from his Second Book, but that does not automatically mean that the Nazis used the frontier as a role model in their planning for the east, that they publicly promoted any such parallels in their propaganda, that they issued corresponding directives, or that local commanders and administrators made (or were made aware of) any such comparisons when implementing these policies on the ground. I have seen a number of documents in which cultural anthropologists discussed US-Indian policy, such as the detrimental effects of forced relocation during the Trail of Tears, and argued that future German colonies in Africa should thus avoid massive relocation and cultural imperialism directed at Indigenous peoples, but I cannot speak to whether or not there were actual plans to that effect in Africa. Neither can I speak to the impact such comparisons actually had on the plans for starvation and relocation of Slavic peoples in the Nazi East. I am looking forward to doing more research into German government documents on these issues one day, and am currently not aware of any previous―and detailed―works focusing on American role models for the Nazi East. Without detailed knowledge of such documents, plans, and directives, Hitler’s remarks on using America’s westward expansion as a role model for the Nazi East are of limited value, for the man had a lot to say about everything in his ramblings. To use a more concrete example of the complexities of comparison from my own work, consider the contradictions between domestic and foreign propaganda: As Kenneth Townsend, Jere Franco and others have pointed out in their works, the Nazis operationalized US groups, such as the German American Bund, to attack the “Indian New Deal” as the Roosevelt Administration’s covert attempt to install Communism in America: the 1934 Wheeler-Howard Act, or Indian Reorganization Act (IRA), ended the policy of allotting tracts of land to individual Native families since the 1887 Dawes Act, reinstating communal ownership of land, and revoking some of the repressive measures against native religions and cultural practices. Communal ownership of land here symbolized Communist collectives and gulags. Back in Germany, however, the Nazis hailed the IRA as the Americans’ (belated) acknowledgment of inherent racial idiosyncrasies: since all peoples, according to racial ideology, come with inherent group character traits determined by blood and their natural environment (hence, blood-and-soil ideology), trying to impose alien culture on a group will lead to that group’s demise. The Nazis argued at home that Americans had finally stepped away from trying to turn ‘Indians’ (who, supposedly, must roam, hunt, or ranch livestock by virtue of their biological heritage) into yeoman farmers, because this practice of cultural imperialism destroyed their culture and peoplehood. US-Indian policy in this regard was praised as good because it acknowledged racial difference and (seemingly) supported racial segregation, which the Nazis quickly exploited to ‘prove’ their own Nuremberg laws on racial segregation as necessary and ‘natural’ measures (i.e., the exclusion of Jews and other unwanted groups from the ‘community of the people’). So, the same legal measures of the IRA were denounced as Communist in the US and praised as benevolent, racially sensible protection of peoplehood at home. In many other aspects, the comparison of the Nazi East and the American West raised more questions than it helps answer. Still, the symposium did great work to address the complexities and pitfalls and thus helped to develop more meaningful comparative approaches to genocide. I have been back in Arizona for more than a week now, to continue research on Native American military traditions and on veterans’ issues, both for the Native and non-Native veteran demographics. It was good to be back in Tucson and spend time at the U of A library, meet old colleagues and friends, and catch up on news. I am currently in Flagstaff for more research and for a conference on comparative genocide studies, which I will discuss in a later post. During conversations both here and in Tucson, it struck me how emotionally charged many of the current political debates in both the US and Germany are, and the role historical arguments play in both. For Germany, it is the often bizarre comparison to Native American history in debates on immigration and the refugee “crisis” that I have discussed in a number of recent posts. Once again, I am surprised that liberals and Native activists in the US mockingly use xenophobic arguments on immigrants to point out that, after all, American society was built on immigration. Yet, these same arguments serve nationalist and even völkisch/racist standpoints in Germany, allowing German nationalists to portrait themselves as the Indians of the 21st century. Here in the US, the recent college shootings in Oregon, Arizona, and Texas have flared up debates on gun culture, once again. The shooting at Northern Arizona University occurred the night before I took the shuttle from Tucson to Flagstaff. Walking around NAU campus in the afternoon felt eerie. I could not help wondering if people I watched were particularly friendly in attempt to assert community and belonging after the event, if the two girls I watched laughing so hard over some text message they had received that they were actually rolling on the floor were excessively giddy to take their minds off of the incident, if people wearing sober expressions were still shocked, contemplative or if they worried about the next take-home exam, or, generally, whether I simply interpreted too much into everyday behavior. Colleagues I talked to, both in Tucson and Flagstaff, were concerned about policy changes the recent shootings might bring regarding gun regulations on campuses. To come back to historical arguments, though, it is scary to see how prominently comparisons to Nazi Germany and the Holocaust figure in the public debate on gun control. This Huffington Post article details some of the flaws in Ben Carson’s recent comments following the shooting in Oregon. In addition to the discussion of German legislation on firearms since the end of World War One described there, including the resulting estimates on how many guns German Jews might have owned in the late 1930s and whether this could have prevented the Holocaust or not, we should also consider that all major German parties had their paramilitary militias before 1933: The Nazis, of course, had the storm troopers and the SS, the Communists had their Alliance of Red Front Fighters (RFB), the Social Democrats, Liberals, and Catholic Center formed the “Black – Red – Gold Banner of the Reich,” the veterans’ organization Stahlhelm formed their own militia, etc. All of these paramilitary and para-state militias were armed, legally or not. They had taken home guns from the war and “squirreled away” guns during the often chaotic events of revolution and civil war 1919-20. There was no shortage of firearms among the German population when Hitler took power. 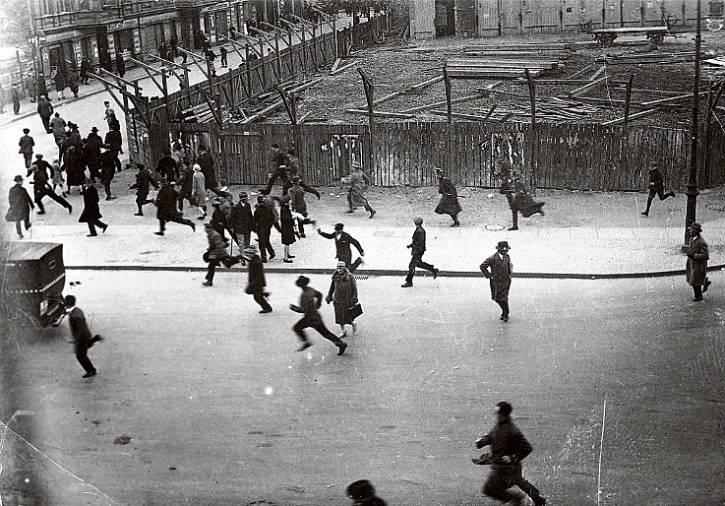 However, these guns did not prevent the Nazis from taking over and, in the isolated events were they were used against the Nazi takeover, such as the infamous “Köpenick Week of Blood” in Berlin in June 1933, they quickly ignited a massive backlash of organized Nazi and police repression. And yet, here we are, having to discuss gun control in the US by way of distorted comparisons to Nazis and the Holocaust once more. In idealist and utterly rose-colored moments, I like to imagine the social purpose of historians to be that of some sort of “guides of public memory,” of people who can tell society, as it approaches another fork in the road and does not seem to be able to decide which way to go, “let’s not go down this particular direction this time, it didn’t work for us the last time we tried.” This would be a role of historians who can break down the complex contexts of historical events for everybody to understand and to draw conclusions from. Apparently, though, and I hope this does not sound too gloomy, historians often are only left to mumble a resigned “I told you so” and retreat back to their dusty archives, while politicians and ideologues spout catchy and unrelated historical anecdotes that all too often are utterly inapplicable to explain the contemporary moment.